I’ve been shopping at JcPenney for as long as I can remember. The one near me is usually pretty hit-or-miss, but their prices and sales/coupons always have me coming back for more. Our JCP doesn’t have a maternity section like some do, but I managed to find a few great pieces for expecting mamas and I wanted to share them with y’all! Y’all. I want to wear this cardigan every day. It is SO comfortable!! It looks like there are only a few left online, but I’ve linked a similar one (also from JCP) as well as a plus-size option! 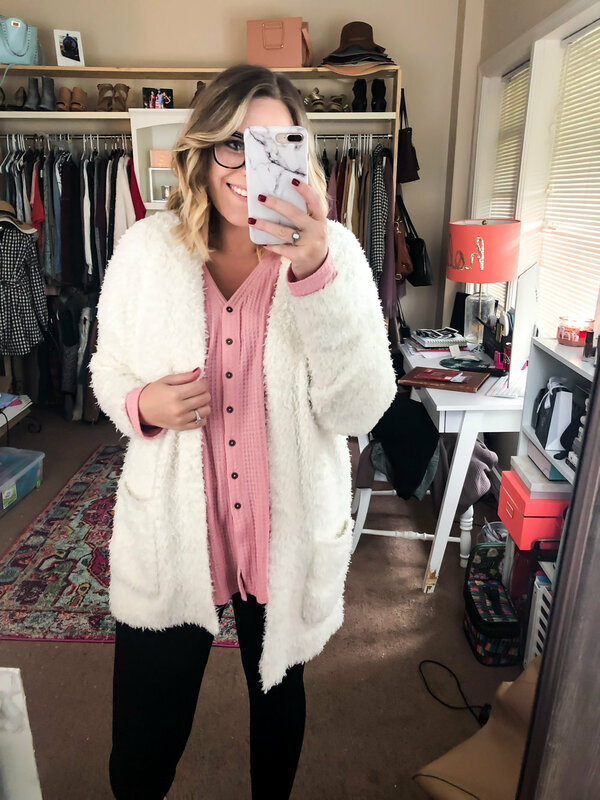 I love me some sherpa and this pullover does not disappoint! It comes in two colors- black and cream- and both have rose gold buttons. The buttons are what did it for me, honestly, but it’s super comfy and surprisingly warm! It does run a little short, so I would size up if you’re expecting or if you like your tops to hit a little lower on your waist. I’m wearing an XXL so I have room to grow in it, but probably would have gone with a large if it weren’t for the baby bump. On sale right now for $17! I’m a sucker for a good v-neck sweater. I have about 50 of them :) The little lace detailing on the shoulder is subtle, but adds such a cute little touch. This sweater is good for growing bumps, too! It’s got a lot of room in the midsection, so I would stick with your normal size if you are expecting! I’m wearing a large in the Iron Grey Metallic. Currently on sale for $9.99!! I posted a pic of this sweater on Instagram a little while back and I can’t say enough good things about it. It’s so comfortable and has ruched sides that make it great for pregnant bellies. I really like the length of it, too. It’s long enough to wear by itself over leggings, but not too long that you can’t wear it with jeans. I posted pics of each color with leggings and with jeans so y’all could see how it looks with both types of bottoms! I’m wearing an XL in Cinderblock and I also have it in Hutchinson Green. I am very picky when it comes to leggings. I’ve never been a big leggings person. I’ll wear them if I’m running errands or lounging around the house, but up until I got pregnant I didn’t wear them very often. My big pregnant belly can’t handle jeans some (most) days, so I’ve literally been living in leggings lately. These ones are super cheap, but are pretty comfy! I have two high-end pairs of leggings, but I wanted a couple that I didn’t have to be so careful with. My favorite thing about these leggings is how long they are. I always have issues with the length of pants/leggings, so I really love that these ones go all the way down to my ankle. I’m wearing a size large in all of the pics from this haul! Only $5 right now, so stock up! Tank tops are another thing I rarely wore until I got pregnant. I wear a tank just about every day now and these seamless ones are my fave! They’re form-fitting (obviously) but they don’t ride up like other tank tops I’ve worn AND they have thick straps- which I love! They come in all sorts of colors, too! They’re great for layering, but I’ve also worn them by themselves with a cardigan/jacket. I have one that is a M/L and one that is a L/XL. The L/XL is still a bit roomy on me (the one pictured), so I would recommend going with your regular size if you’re not very far along. Only $7 right now, so I’d stock up on these, too! Figuring out how to dress the bump has been more of a struggle for me than I ever thought it would be. I don’t want/don’t have the money to stock up on a bunch of maternity clothes, so when I find non-maternity pieces that I can wear during AND after my pregnancy, I get really excited! I’m sure there are a lot of expecting mamas out there going through the same thing, so I’ll keep sharing everything that I find! 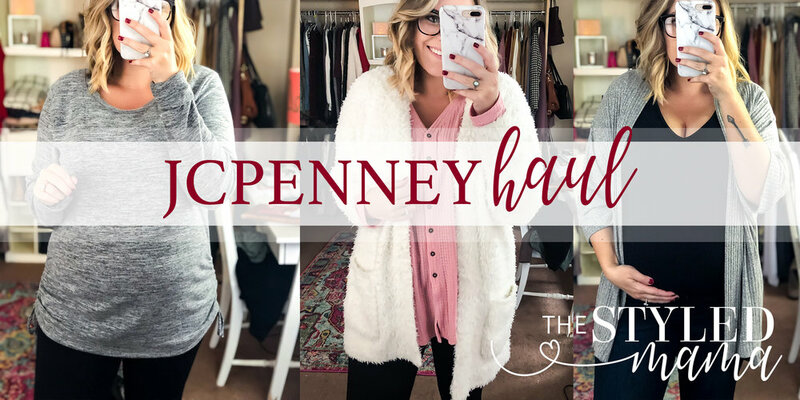 JcPenney is having their Black Friday Early Access Sale right now, so if you’re not into fighting the crowds on Black Friday, I would definitely suggest hitting up this sale! Welcome to THE STYLED MAMA, so glad to have you here! !